A night out at Syn Beresford’s beautiful Skyfall. I wore Mami Jewell’s redone gown, which now includes appliers for almost every body in a brilliant one-piece HUD and her flowing flexis. Add AvaGardner Kungler’s new necklace for the Cosmopolitan Room and the evening is set. Mirja Mills made this lovely updo for the Cosmopolitan Room as well that includes two rhinestone barettes and, as always, is imbued with romance. Kaoz Koba recently came out with a new mesh head for ladies, this lovely look that includes makeups made by SlackGirl in the HUD. I chose a makeup add-on from Slack girl for the eyes to increase the drama. He spoiled her rotten and she knew it. He was a goner for her red hair and she was a goner for his huge estate in Tuscany. Not scheduled for any of the B-grade movies she found herself in, she could luxuriate for a few days by the his pool. Of course, she shouldn’t be out sunbathing but how could she resist when she had this gorgeous suit from ValentinaEvangelista from the Mesh Body Addicts Fair. No other woman would go out to the pool in jewelry but she wanted to make a statement—about luxury, about beauty, about how a woman like her could wear her jewelry anywhere she damn pleased. 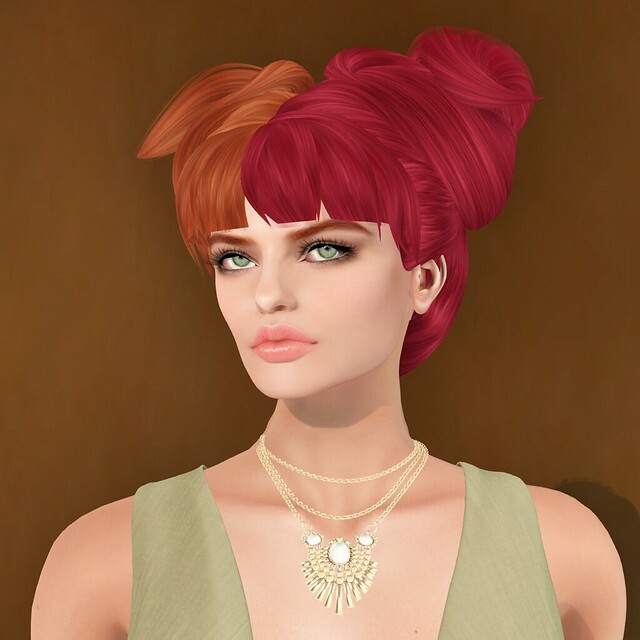 The big beautiful gems on Gyorgyna Larnia’s necklace and earrings for Fameshed made all the statement that needed to be said. High heel platform shoes from Senzati0n Domenitzo for Shiny Shabby even made it out on to the raft in the middle of the pool. Her face got him first—she looked like a redheaded Kim Basinger. Little did he know it was Kaoz Kobe’s newest mesh head from the Mesh Body Addicts Fair. A few clicks and glossy lipstick and eyeliner finished her captivating look. The final touch was waves of pageboy from Mirja Mills for the Crossroads Event. She was a siren, a seductress, and she was beside his pool. It’s all he could ask for.